To describe our adventure through the city of Atlanta, I guess the place to start is at the very beginning. What happened was that we decided to add on a trip to Atlanta after Chris’s work conference in Nashville. It would require a 4-hour drive. Four hours is nothing to Chris and I. But we had our concerns with Trevor, who’s a walking, talking burst of pure energy. And our ball of energy don’t love being strapped into car seats for more than 30 minutes. A lot of days, we’re lucky and Tru will sit quietly for an hour or even two. We’ll play a children’s music cd for a while. Then he’ll watch some shows on the kindle for a while. Then he’ll have some milk and eat a little snack. Then he’ll watch the cars and trucks pass by us on the road for a while. Unfortunately, our travel day to Atlanta was not that kind of day! Trevor was fussing and whining pretty much from the start of the road trip. He didn’t want to watch any of the shows we had downloaded on the kindle. I gave him a muffin to snack on, and his overbearing toddler grip crumbled the muffin into five thousand pieces all over the backseat of the rental car. At one point, he started melting down about how much he wanted to get out of his seat. When we finally arrived at our halfway point for a break, both Trevor and I were in terrible moods. It was extremely hot outside. And the stress of dealing with it all was wearing on Chris too (he is normally the most grounded, steady one). So here’s how our halfway-point break went: We decided to stop at a stunningly beautiful tourist spot called Rock City. It’s an attraction on top of Lookout Mountain, just a few miles from Chattanooga, TN. The experience began with an employee holding a camera, who had us pose for a family photo. Next, we enjoyed a very easy hike/stroll through caves, past waterfalls, and over a long suspension bridge. There were lots of beautiful, natural scenes to take in. At the end, there are sweeping views from the top of Lookout Mountain. Unfortunately, there were several meltdowns during our time at Rock City. For example, near the end of the trail, Trevor turned around and wanted to retrace his steps and go backward. Chris and I did not want to re-walk the trail. So that ended in a meltdown. After we made our way across the suspension bridge, Trevor was in love with that bridge. He wanted to walk the bridge again and again. Unfortunately, the bridge was very narrow and there were many tourists tying to make their way across, so it wasn’t a place where Trevor could run free as he wanted. So that ended in a meltdown. By the end of it all, Chris and I were both starving for lunch, sweaty from the heat, and weary to our bones. As we made our way out of Rock City, the employee who’d shot a photo of us at the beginning was offering a print-out of the photo for us to see (hoping we’d purchase it). It was a beautifully composed photo of all three of us, with the stunning landscape of Rock City as a background. But then there were our faces. Trevor: squirming out of Chris’s arms, and looking angry. Me: frizzy hair from the heat, a grimace on my lips, a furrowed brow, and serious eyes filled with exhaustion. I had to laugh. Thinking back, maybe I should have purchased that photo, just as a momento to cover the full range of experiences of family travel! Needless to say, all three of us were pretty weary when we arrived in Atlanta. Happily, things turned around for us completely once we arrived at our destination. Our hotel room was ready as soon as we arrived, so we were able to get Trevor down for a much-needed nap. I think Chris and I probably needed a nap for a while too that day! After that, we were refreshed and ready to explore Atlanta for the evening, so we headed to the Atlanta Botanical Garden. I love botanical gardens more than anything, so I’ve visited many of them. And the Atlanta Botanical Garden totally blew me away, it was so stunning. The grounds were beautifully landscaped with fountains and sculptures and vividly colored flowers. The golden glow of sunset was starting to arrive, the midday Atalanta heat was gone, and there was live music floating through the air. But it was the living sculptures that really amazed me. Made of living plants in a variety of colors, the sculptures were giant and really intricately detailed! The best thing we can possibly find for Trevor on our travels is a big, wide open field where he can just run free without having to hold our hands or take orders to “slow down” or “hurry up”. 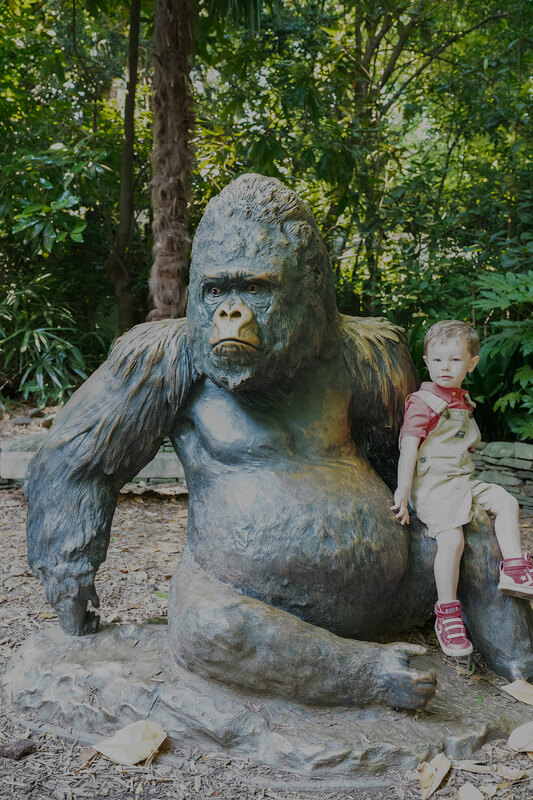 He found just that at the Atlanta Botanical Garden, and there were other kids his age running around for him to chase. He had the biggest grin and the most rosy cheeks from running. The times when I’m able to witness Trevor feeling truly joyful like that are the best moments of my life. Atlanta Is A Destination For Families! The truth about Atlanta is that I never had any interest in visiting. But Chris had been to Atlanta for work and was convinced Tru and I would both love it. He was right! Atlanta is an incredible destination for families. For starters, the Georgia Aquarium was the most incredible aquarium with the largest floor-to-ceiling tanks I’ve ever seen. Trevor was fascinated by everything. Just like in Nashville, Tru caught sight of the escalators in the center of the aquarium. He would have ridden up and down for the rest of the morning. And, just like in Nashville, he threw a tantrum when we tried to drag him away. Luckily there was plenty to distract him! There was a dolphin show (no cameras were allowed so I can’t share photos) that Tru actually sat quietly through because it was so incredible to see such enormous creatures leap and dive so close to us! And then there was Zoo Atlanta, which is one of the top zoos I’ve visited. It was just so nicely landscaped with huge, shady trees everywhere. And there was a wide variety of animals to see. Trevor’s favorite part of the zoo was a steam engine train that visitors could ride. As soon as he saw he caught sight of that train moving along the track, he kept saying “Choo Choo!” So we got some tickets, and Tru had the biggest, brightest smile for the entire train ride. Something very cool and surprising happened to us in Atlanta, but first, I have to explain one thing. Chris and I were absolutely obsessed with the show Mad Men while it was on. We had to be sitting down on the couch a few minutes before it began, with closed captions on, so we wouldn’t miss a word. We never snacked during Mad Men (no noisy crunching, too much of a disruption). We were in love with the show. So what happened in Atlanta was that as we were walking into our hotel one evening, Chris turned and looked at me with the most excited and shocked expression. He was mouthing something to me that I couldn’t make out, but I got the idea that he was telling me to look straight ahead. Sure enough, in front of me was “Roger Sterling” (John Slattery, who played one of the main characters from Mad Men). He was noticeable immediately because his hair was very thick but yet really white. He was thin and what surprised me was that he wasn’t much taller than me (I’m 5’4). He walked right by me and the moment was over and I didn’t say a word to him, but I was so thrilled I had gotten that close to Roger Sterling. Chris and I discussed what we’d say if we got a second chance and walked by him again (we assumed he was staying in the same hotel since that’s where we saw him). But we never really came up with anything good to say. And we did see him a second time (he was exiting the elevator as we were waiting to get on). And again we didn’t say anything to one of the stars of one of our favorite shows! What’s wrong with us?? Trevor loves traveling. He loves airports, he loves planes, he loves learning that he will be going on a brand new adventure. He loves staying in hotels (and he knows there’s often a pool at the hotel, which makes him love them even more). His favorite things about hotels: rolling around on the hotel bed and starting pillow fights and tickle fights. He also likes for all three of us to get under the covers, with Tru needing to be right in the center. He’ll say “Daddy tuck in here” (pointing to his right). And “Mama tuck in here” (pointing to his left). And then he’ll request to be tucked in (“Trevor tuck in”). Literally one second later, he’ll leap up and start rolling around again. Trevor hates bedtime (“no bed!” “no sleepy!”). But he loves the hotel bed! And he loves pressing the buttons in every elevator he rides on. Although his language is still way too simple to express, I feel that he gets as much of a thrill from exploring a new place as I do. Here is one thing I love about Trevor’s schedule right now: he takes 3-hour naps each afternoon! He’s never tired until about 2 pm. But. When 2pm rolls around, he’s normally ready to get into his crib (or pack ‘n play) with a sippy cup of milk and a few of his toys cars/trucks. And then he’s out cold until 5pm. I can’t blame him, with how much energy he burns throughout the morning! But those afternoons of peace and quiet are wonderful opportunities for me to work. And I really don’t know what I’ll do when he decides to drop that nap! He’ll say things like “help Trevor pease” and say a high-pitched, sing-song “dank-do!” (i.e. “thank you”) for any help he gets. Or he’ll say “no dank do” when he really doesn’t want to do something. It was after 9pm and our little hotel room was dark because we’d put Trevor down in his crib for the night and turned out all the lights. But we’d kept the curtains open, and the city lights were providing plenty of light in the room for Chris and I.
We’d asked to have our dessert packed to go at dinner that night, since Trevor was getting squirmy at the table. So Chris and I sat on the wide windowsill, enjoyed our cake, and just looked out over the city lights of Atlanta under a wide open dark night sky. I can’t believe I ever thought I’d have to give up one of the things I love the most – travel – once kids entered the picture. What I’ve learned with our travel journey so far is: where there’s a will, there’s a way. It might take some imagination. It might mean sacrificing some old comfort zones. It might take some exhaustion and a few tears.